I interviewed and wrote an article about this man last year. 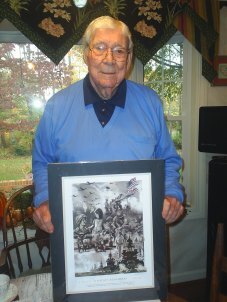 He had just been honored at the World War II Memorial in Washington with a group of NC veterans. At 87, he was sharp, witty, charming and told me things about World War II that brought tears to my eyes. He’d been married for 59 years before his wife passed away from Alzheimers. Our meeting lasted nearly three and a half hours before I made myself say goodbye. I could have listened to him talk all day. We hugged when I left and he called me for days after the interview asking me when it would run in the paper. Months later I saw him again in the waiting room of a dentist office. I was excited to say hello and introduce him to my children. However our meeting would play out differently than I expected. He had no idea who I was. I reminded him of the article in the paper and of our conversations, but he stared back at me looking dazed and confused. I spoke with his daughter soon after and she wasn’t surprised. “He has his moments,” she somberly said. He’s not the same man that he was last fall. His memory is slowly fading and he has a slight limp in his step. But for those who know him, he isn’t just another aging senior; he’s a brave World War II veteran that risked his life for people like me. I’m blessed to have had the chance to tell him thank you.